Our feisty little Jack Russell is named Milo. He is 5 years old, fearless, loves the outdoors and his family. We actually have a lot of people ask us if we give him tranquilizers because he is so calm. Of course we do not, however we spend a great deal of time with him. He goes everywhere with my husband and he is feircly protective of me. He loves ice cream, chasing squirrels and swimming. 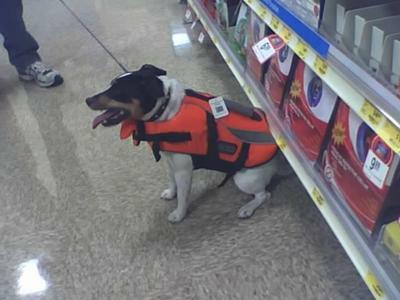 He vacationed on the Boise River last July, went rafting actually so he had to wear a life jacket. He is the best dog ever and brings us so much joy. I hope that you put Milo in for the JRT of the month. He is just wonderful. Mine is not that calm, but I think she is getting less rambuncious as she gets older. I missed this earlier, as I just returned from a trip to Turkey. Have a great day and kiss Milo for us!